Located in south-eastern California, Joshua Tree National Park is instantly recognisable for its vast desert expanses, spectacular sunsets, and peculiar Dr Seuss-like trees. The vistas are at times like something from another planet, and visitors can spot bighorn sheep, coyotes, bobcats, rattlesnakes and a variety of birds in the brush. Barker Dam, near Hidden Valley, is a great place to spot wildlife. 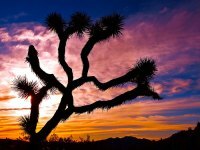 Joshua Tree encompasses parts of both the Colorado and Mojave Deserts, and has nine designated campgrounds. There are good hiking trails and nature walks, and visitors can also view the park by horseback and 4x4. Opening times: The park is always open, while the Joshua Tree Visitor Center is open daily 8am-5pm. Admission: Seven-day entry and vehicle permit is $25. The entrance fee is $12 for each motorcycle, bicycle, or person on foot. Camping fees vary.